Rest easy tonight with GoodNites TRU-FIT Underwear for Boys, from the leading Protection Brand. TRU-FIT bedwetting underwear is Real, Washable Underwear with Super Absorbent Inserts. The underwear is made of a soft, cotton-blend fabric, with a water-repellant interior coating and sealed seams. When used in combination with TRU-FIT Disposable Inserts, these pants provide outstanding protection for both pajamas and bedding. TRU-FIT Underwear comes in sizes Small/Medium (38-65 lb.) and Large/Extra Large (60-100+ lb.). The Starter Kit includes two pair of reusable bedtime underwear plus five disposable inserts. Additional TRU-FIT insert pads are available in refill packs (sold separately). Bed wetting is common, affecting one in six children ages 4 to 12. 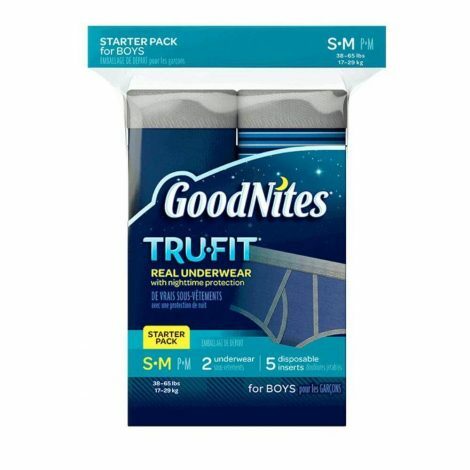 Protect your child from nighttime discomfort and help encourage confidence with GoodNites TRU-FIT Underwear. GoodNites has revolutionized bed wetting protection with GoodNites* TRU-FIT* Underwear and GoodNites* TRU-FIT Absorbent Inserts. The new bedwetting underwear for boys look, feel and fit like real underwear, but offers outstanding night time enuresis protection when combined with new GoodNites* TRU-FIT* Inserts. TRU-FIT* bedwetting pants have fully sealed seams and a water-repellant coating to boost bed wetting leak protection. Combine with GoodNites* TRU-FIT* disposable inserts, a six-layer advanced absorbent technology to lock in wetness, and you have a discreet solution that helps give kids confidence over bedwetting. GoodNites* TRU-FIT* nighttime underwear for boys can be washed, folded, and put right in the dresser with regular daytime underwear. Keep kids confident while easing the frustration of bedwetting accidents.